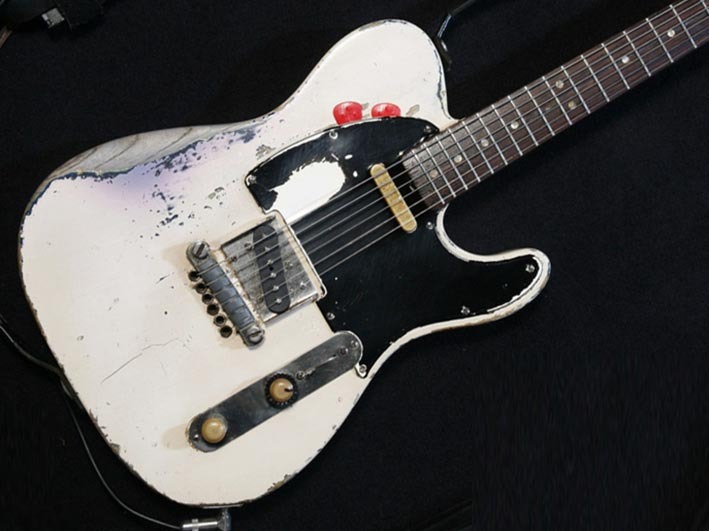 If Roots Replicas were to build a Rick Parfitt Telecaster, which version would you like to see? The guitar in the first pic is Rick’s Tele at the time of Live Aid. The pic is taken from the cover of the 7″ vinyl single of Rollin’ Home (UK release: 9 May, 1986). There is not too much wear evident at this point in history and only a tiny area of the black film that covers Rick’s white pickguard has worn away. 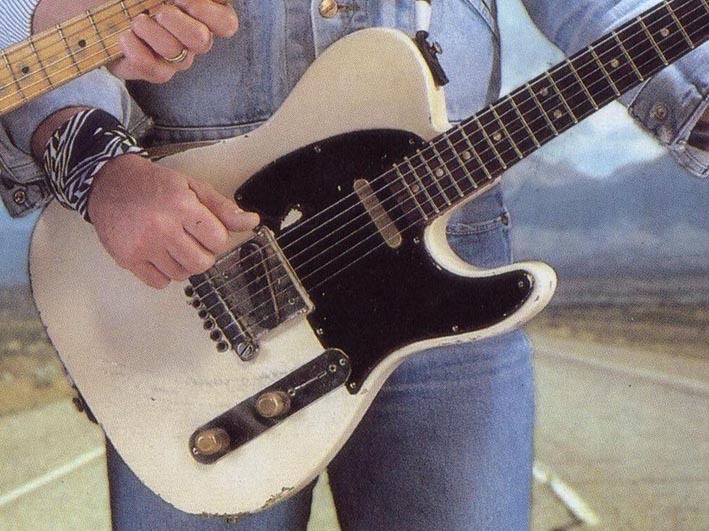 The patch of wear from Rick’s forearm and the general wear and tear on the guitar was quite minimal back then. The guitar in the second pic is how Rick’s Tele looks today (30+ years on from the pic on the left) and was referred to by Rick as his ‘Rock n Roll Range Rover‘ as you could throw anything at it and it would just keep going! Which one would you like to see built? Some time ago I conducted a poll on this page to see which of the above versions of the guitar people would like to see built. 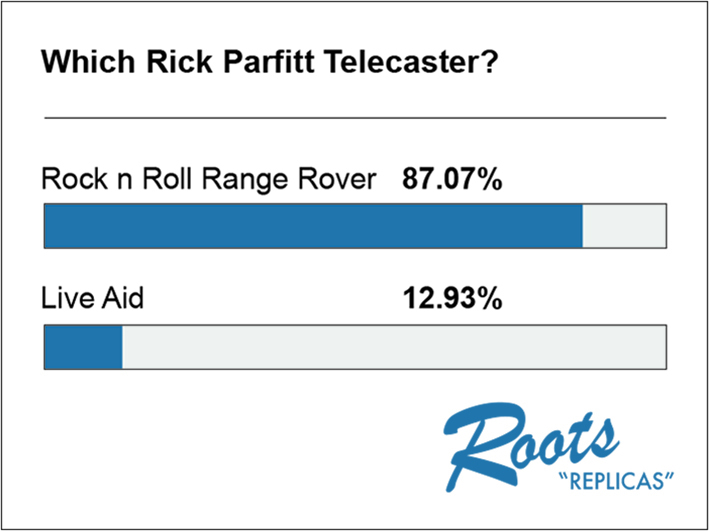 The overwhelming response was that 87% of those who voted wanted to see the Rock n Roll Range Rover get built. Many thanks to everyone who took time out to vote in the poll. If a Roots Replicas build of a Rick Parfitt guitar does go ahead, it will be the Rock n Roll Range Rover configuration of the guitar that will be created, as voted for by the followers of this blog. I am currently working on a set of highly detailed technical drawings in order to map every surface and contour of Rick’s guitar. It’s so important to get down to this level of detail when attempting to recreate a replica of such an iconic and unique guitar. There are literally hundreds of Rick Parfitt replicas Telecasters out there and some of them are really good, but I don’t think I have ever seen one that is exactly right when it comes to the relic’ing and general recreation of wear and tear. The challenge here is to build something that goes just that bit further in order to achieve the authentic look and feel! Mapping Rick’s guitar without access to the genuine article is a complicated process and involves the careful study of hundreds of pics and video clips as well as taking detailed and precise scale measurements from various pics of the guitar, both old and new. In addition, it’s also worth delving back in time through some of the older pics of Rick’s guitar to see just how the wear and tear has evolved over time. We are not just trying to replicate the front and back of the guitar (which is challenging enough) but we also need an accurate map of the body sides too and some of the older pics from back in the day can be very useful in terms of checking how a small ding or dent has become more pronounced over years of gigging. 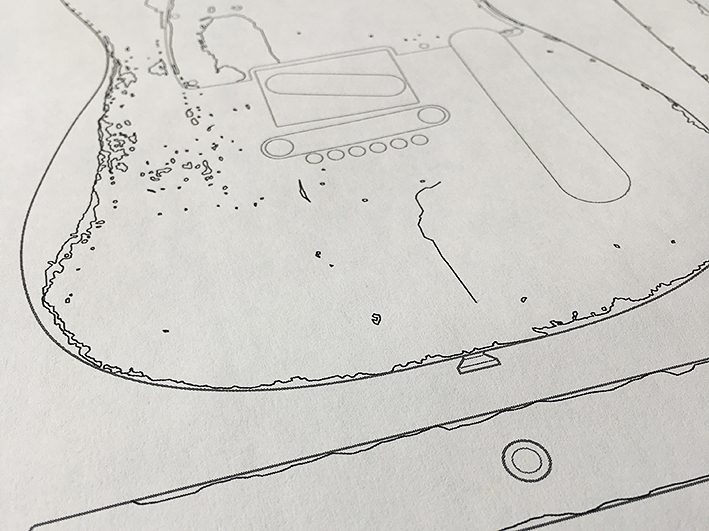 All of the detail in the drawings will have to be carefully transposed to the body of the guitar, following what is quite a complicated and multi-layered painting process. Building a Rick Parfitt replica guitar is simpler in some ways than building a Francis Rossi replica, especially in terms of the hardware involved. However, when it comes to the general relic’ing to the body front back and sides, a Rick Parfitt build presents a far greater challenge! So far, some good progress has been made with the technical drawings, but no definite decision has been made on whether to go ahead with a build. If we do proceed with a Rick Parfitt Rock n Roll Range Rover guitar, all details will be posted right here on this page in due course. Thanks for continuing to follow this blog. How much will they be please? I was curious how you applied the black glossy cover film at the pickguard ? 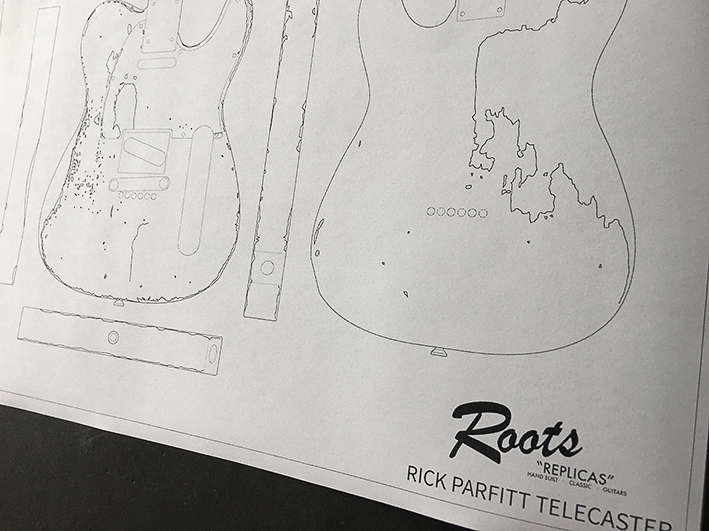 The latest on this, is that after conducting a vote on which version of Rick’s guitar to build, we are preparing detailed drawings of Rick’s later version of the guitar, but no work on a build has started as yet. Any new builds will be announced on the blog in due course. Hello Andy, I am interested at a Replica of the Rick Parfitt Telecaster. I find out your website today but I am not sure what is the right way to get one. Are your going to built it after a direct order or let you know the interested customers if you got one in your offer ? And about how many €s I have to calculate ? Please excuse my bad english .. I haven’t started any new builds recently. The next build may be a RP model or could be another FR Live Aid model. When a build commences all of the stages are recorded on the blog and at the end of the process the guitar or guitars are sold. The best thing is to check (or follow) the blog as all news regarding new builds will be posted there.